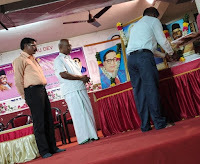 To commemorate the birthday day celebrations of Dr. Ambedkar, the 4th year Annual social harmony award function was organized in Chennai today this morning at Maharishi Vidya Mandir School. The dignitaries at the dais were the three awardees for this year on this august day, Sri. M.A. 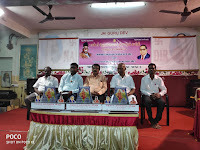 Krishnamurthy, Gandhi Youth Association, Vyasarpadi, Chennai, Sri. B.R. Arumugam, Viduthalai Social Welfare Trust, Ponneri, Sri. A. Mahesh, Netaji Navabharath Foundation, Otteri, Chennai. The award function was headed by Dr. B. Venugopal, Ph.D., Professor, Department of legal studies, Madras University, and Sri. 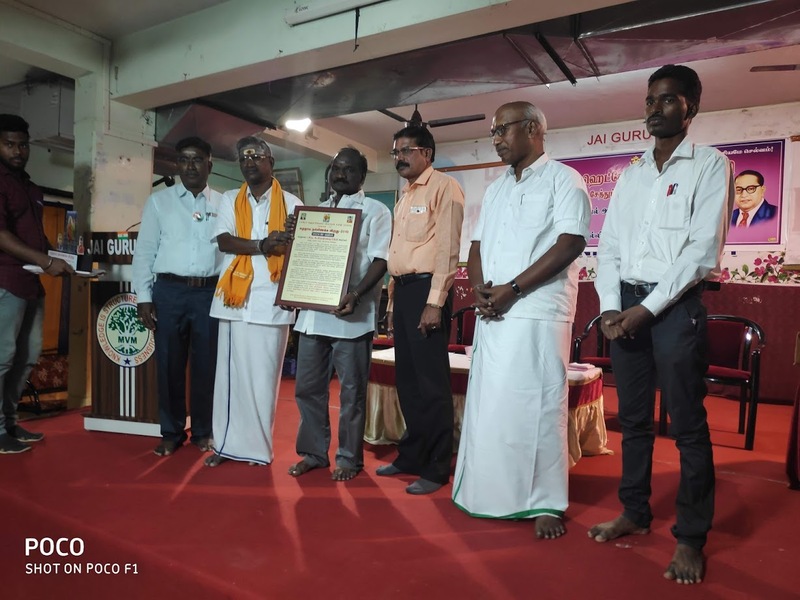 R. Vanniarajan, Retd Principal, Vivekananda College, Thiruvedagam, Madurai, Head TN and Kerala state RSS were the other two dignitaries on the dais. 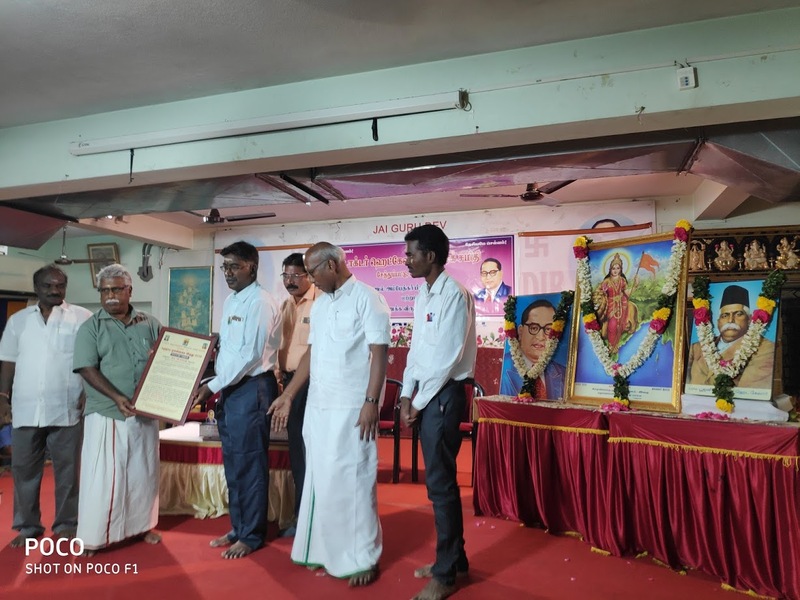 The august function started with a prayer song and a welcome speech given by Murugan ji, who welcomed the awardees, the gathered audience, quoted, “1st day of the chithirai month is always celebrated as Dr. Ambedkar’s birthday and the function is being held this day. Remembering the 1919, 100 years of the Jallian wala bagh, cruel shooting by General Dyer, the heinous act ever done by the British, towards which we had expected an apology, the least they did was to convey their regret, which is the latest news as of yesterday. Now the guest-awardees were introduced one by one and their speeches are being reported as under. First Sri M A Krishnamurthy was introduced, born on March 7th, 1956, at kalyanapuram, Vyasarpadi, Chennai, though born into a poor family, since his early age he wanted to achieve in life, passionate about boxing which led him to learn the art and paved his way in participating at the National level in the 1978, won the match for himself and added glory to Tamil Nadu. In the year 1950, Sri. Kakkan ji started the Gandhi Youth Association, having worked in the Government, alongside he indulged himself in social service and worked for the upliftment of the people in that area and giving them incessant help at the time of the need. For the past two years, he has been campaigning and conducting camps for the cause of women, an awareness for breast cancer and heart related problems and for the students to procure free education he has been of immense help to them. He has been creating ripples amongst the youth, for conducting awareness campaign for wearing helmets while riding, fitting camera into the area where the utmost downtrodden people live, to monitor their well-being. So far his selfless service has been recognised and awarded by the Nadigar Sangam in the year 2013 and by the Commissioner of Police in the year 2019 for his outstanding selfless social service. In his speech, Sri. M A Krishnamurthy said “He reminisced his past for having won the Boxing Championship, he is still in awe while remembering Dr. B.R. Ambedkar ji, that he was the only one who fought for the voting rights of all the people immaterial of the strata of life they came from and he made the people become aware of their VOTING RIGHTS TOO. He still offers his prayers to Dr. Ambedkar’s photo”. The next awardee introduced, Sri. B.R. Arumugam, born in the year 1990, on 23rd April, at pakkam, hailing from a very poor family, having lost his father at a very young age, brought up by his mother single handed, he had great interest to study well. That’s how he completed his schooling and college. At that time, he observed the plight of other children in the same locality he came from, either they never went to school or some of them were sent as child labourers. Disheartened, first thing he did was to create an awareness for the children and their parents to send their children to school to educate them is the first priority to come out of the plaguing poverty. He instituted the Viduthalai welfare Trust, through which he has created free teaching centres for those children. He has enhanced the quality of life of 15 villages and has been helping their cause for a long time now. 114 houses have been built for those tribal people in that area and 300 families have been given training to do their own business where they can be self-employed. Moreover, he has created libraries in two villages, 15 students were given teacher training, 130 women have been taught tailoring and 250 students have been given free education from his trust. In his speech he said, “the 15 villages where the students are studying, are evening schools, it is from Dr. Ambedkar that he has this feeling to do something for the society, the tribal peoples’ 400 children joined school back it was owing to the teachers are the main reason for this educational knowledge to be imparted”. Next awardee Sri. A. Magesh, Born in the year 1975, on November 25th, at Otteri, Chennai. Owing to the financial constraints at the home front he had to stop with finishing his school studies and had to take up work and continue college education through distance education. In the locality he lived, he observed that owing to lack of awareness towards education, children going to school was much less, in the year 1994, he started the Netaji Navabharath Foundation, through which he started all his welfare plans. He still conducts camps for the backward people, for hygiene, education awareness. Moreover, he ensures that the many welfare schemes of the Government reach the people by helping them to get it. In the year 2019, he has started free legal aid services through which he makes people become aware of the laws that we have. In the year 2018-2019, when Government schools conduct special classes he ensured that those children got enough food at the time, 265 school children have been benefitted by free education facility through his efforts. He strives hard for the people in his locality to get the right welfare schemes for their benefit. In his speech he said, “RSS has always been in to Country’s Service, they are the people who love the nation, they take the country in the right path, they uphold the country and those who are against the country’s interest should be imprisoned. Dr. Ambedkar also believed for the cause of the Nation and we are all happy, should feel proud that we are also upholding the same cause. Service towards the downtrodden, free medical, blood donation camps are being conducted, imparting education being the main motive. They celebrated their 25 years of service and look forward to more than 25 years to come. Their council has been fighting for creating awareness for people not to live on the banks of the Coovum river, they want them to be excavated from that way of living in such pathetic conditions, for the simple reason because, since most of them are indulging in wayward, cultureless life, with no proper livelihood because of lack of education, circumstances which force them too to have an immoral way of life, that needs to be redeemed”. Interestingly, he connected Brahma to LEGISLATURE, or the creation of laws. Protector to EXECUTION, executives who protect the laws made, Destroyer to JUDICIARY that is the destroyer of the evil in the society. He compared the carrier of creator is Annam or swan, which knows to separate milk and water for which knowledge is needed that is why Brahma had Saraswathi as his wife. Same way to protect the world one needs financial support, that’s why Vishnu has his wife Lakshmi who sleeps on the snake all the time, for he is restless all the time. For the destroyer shiva, he needs mental strength for which Parvathi or Shakti supports him and the snake that is coiled around his neck would suddenly turn fatal even to shiva himself when the third eye opens, even Shiva’s crime won’t be excused. The damaru on Shiva’s hand is like a legal notice to people who have committed any wrong to draw their attention. It is a misconception to say that shiva has two wives, his wife is Parvathi and ganga is not his wife. Ganga is the wife of Shanthanu and they gave birth to Bheeshmar. When there was dearth of water on the bhoomi, everyone requested Bhagirathi to come and flow, in the scare that the earth won’t be able to withstand the pressure of her flow, which would result in earthquake, shiva gave her place on top of her head so that the water that flows on the earth the pressure is felt less. So that’s how ganga came to find her place on Shiva’s Jada. Here the separation of powers comes into play, how that happens is when shiva wants to visit brahmalogam, no one thought that he will be stopped, but much to his anger he was. He appealed to Vishnu why wouldn’t he be allowed for which Vishnu told him it is better each one lives in their own land, so that no collusion would take place. This incident was humorously said quoting an Allahabad Court Case, where the speaker raised a case against two journalists who reported the assembly matter as is where is. Intimidated by their writing the speaker filed a case against them and had them arrested. When the two journalists went to court for a bail and was granted, the speaker again filed a case against the two judges who granted bail to the journalists. He concluded saying that Religion and laws are the same”. Sri. Vanniarajan ji, in his speech, “Remembering Dr. Hegdewar, on his 129th birthday, congratulating the three awardees on their selfless service to the people and society at large. He was really happy to see the floral decoration on both Baba saheb and Dr. Hegdewar on the dais. It was almost the same time that these two great individuals strived had for their cause to the society at large. It was the dream of Swami Vivekananda to see the change in the society, how to bring about the change that is, by one’s own hard work and efforts taken only. We struggled for independence and we should always worship BHARATHA MATA. All houses whether they have their ishta deivam photo or not they should have one BHARATHA MATA, whom everyone should worship. As the saying goes, maathru devo bhava, pithru devo bhava, aacharya devo bhava, athithi devo bhava, should be kept in mind. Dr. Ambedkar, dedicated his life for social work cause, who, whatever be the testing times, he never showed hatred on anyone for anything. Though he lived all his short life as a non-hater, he used to get angry, that too like, how a mother would get angry to reprimand her child. His apprehension was how independence has been gotten, the same should not to be lost. Our country is Bharatha Mata’s desh, whatever happens against her, against her country, like disrespecting her, violence, should never be allowed. 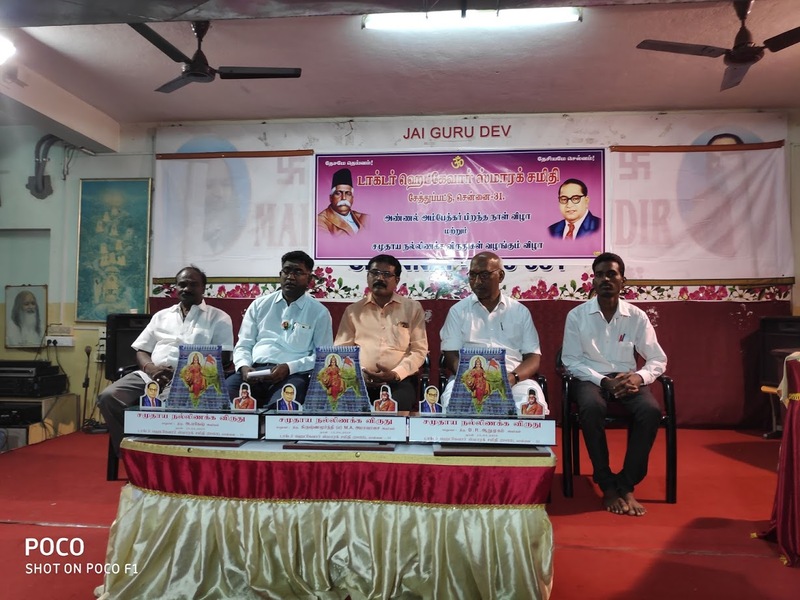 Baba saheb’s predictions came true, when he said in futuristic view, that vote banks would get separated on the grounds of religious connotations, this was seen as a living example by the person who was seen always with him and read all his books to make a compilation of all his books, Sri. Dattopant Thengadi ji (Bharathiya Mazdoor Sanga founder). Baba Saheb lost elections despite doing all the service for the preparations for the elections in the best possible way. Thengadi ji asked why Baba Saheb changed his religion to Buddhism, he said to have quoted about RSS, how much ever one has grown, common man should not be over taken my community. Hindus have all given their might for Bharatha Matha, so he changed to Buddha religion, though after this he passed away in two months. He also reminisced, a particular incident that happened in 1934 December 25th, where, next to Mahatma Gandhi’s sevashram, a big crowd had gathered. Inquisitive to know what was happening next day i.e., on the 26th early morning, Mahatma Gandhi himself went there early morning and was astonished to see the large crowd gathered there. When Gandhi asked the RSS representatives about the practices of RSS, that is all of them being together, eating together, he went to probe about the religion aspect of the people who had gathered there. He was told that, they are very amicable with each other, there is absolutely no distinction between them, of course there are many people who come from the lower, downtrodden society and community, but ultimately we are all Hindus, we are all children of BHARATHA MATHA’S”. Next Vote of Thanks was given by Sri. 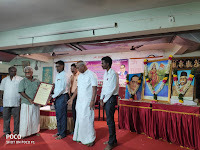 Raghavan ji, Chennai Mahanagar Kaaryavah, who was happy to inform that this was the fourth annual award function and thanked the awardees, chief guests and the audience gathered there. The award function came to a conclusion by singing the National Anthem.